Indian Springs, NV – On Friday, April 1, morning traffic at Creech Air Force Base was diverted by dozens of peace and justice activists attempting to shut down the armed drone attack program through nonviolent civil resistance. At 7:45 a.m., eleven peaceful resisters were arrested at the two main gates of Creech. 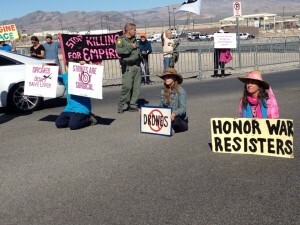 At 10:00 a.m. another six were arrested at the main East Gate while blocking the entrance with “crime scene” tape, referring to the criminal activity of weaponized drone terrorism conducted at Creech, killing thousands of non-combatants and civilians over the past decade. 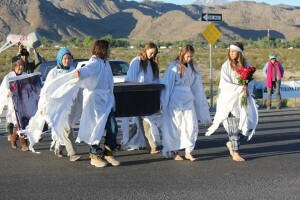 These arrests, conducted by Las Vegas Metropolitan police, were the last waves of repression this week from Clark County, which has failed to investigate or stop the alleged extra-judicial assassinations conducted at Creech. 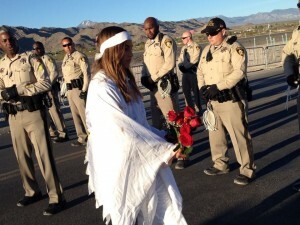 Fourteen of the justice and peace activists arrested on April 1 received citations for jaywalking, and three received citations for trespassing on federal property. 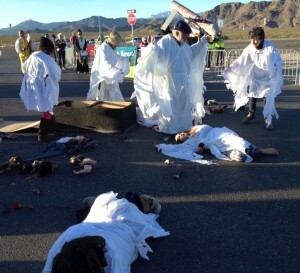 The 17 activists arrested on April 1 were: Toby Blome, MaryKate Glenn, Shirley Osgood, Chris Nelson, Mahaia Oliveira, Tyler Schaefer, Dennis Duvall, Susan Witka, Fred Bialy, Ron Foust, Arla Ertz, Brian Terrell, Leslie Angeline, Cynthia Papermaster, John Ford, Rene Espleland and Flora Rogers. Some of the activists are being held in jail over the weekend. 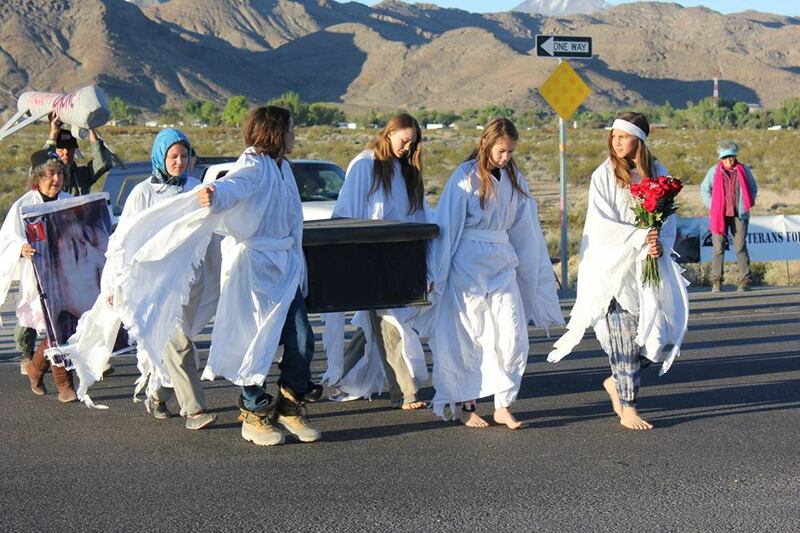 Nevada Desert Experience (NDE) is an active non-profit organization in support of this week’s anti-killer-drone protests at Camp Justice. 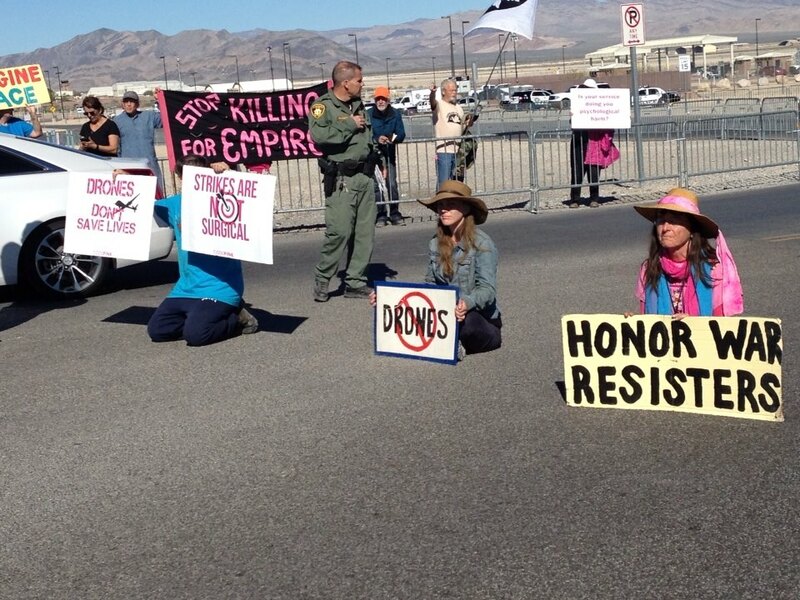 Camp Justice is organized by Veterans For Peace, Code Pink, NDE, and Voices for Creative Nonviolence. 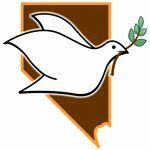 For more information, see NevadaDesertExperience.org or call 702-646-4814. DATTA KHEL, Pakistan — This was once an oasis of calm, a peaceful town in a region famous worldwide for its lawlessness and violence. But in 2007, all that changed when Datta Khel became the primary target of unmanned U.S. drones armed with hellfire missiles. Even with the killing of Al Qaeda leader Osama bin Laden outside of Islamabad on May 2, U.S. and Pakistani intelligence officials believe this town is the command and control center for members of Al Qaeda and its remaining senior leadership. It is also, they say, home to the Pakistani Taliban and the Haqqani Network, a Pakistan militant group that has launched continuous attacks on U.S. and NATO forces operating in Afghanistan. Many of these militants have poured into Datta Khel, which borders northeastern Afghanistan, and the nearby town of Mir Ali in recent years as they have fled Pakistani military operations in South Waziristan and the Swat Valley.